Like any other competitive exam, KCET (Karnataka Common Entrance Test Exam) also demands students to be focused and highly determined to achieve their goals. KCET is conducted by the State Government of Karnataka for aspirants who wish to study in various professional colleges of Karnataka. These aspirants can take admission into courses like Medical, Engineering, Architecture, Dental, Naturopathy, Homeopathy etc. through KCET. KCET is not only about hard-work, but also about some small smart practices that take students a long way. Just like JEE, KCET tests a student’s analytical skills with speed and accuracy. Hence, KCET aspirants must work on their speed and expertise in their selected domains. In fact, there are some other smart practices that all KCET aspirants can take advantage of to crack the examination. Be Familiar with your Paper-Pattern: Being familiar with the paper-pattern is important as it helps you plan your preparation strategies accordingly. KCET is all about objective type questions, which needs to be answered within a prescribed time limit. You can plan out your preparation once you know this basic fact. 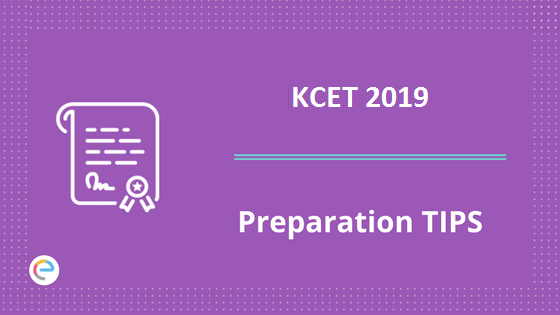 Planning Your Topics: Planning your KCET schedule is important. Plan all the topics you want to cover in the specified time period. It will help you cover your syllabus in time and also give you enough time for revision. Best Study Materials: There is no doubt that the success in KCET and any other competitive exam largely depends on the kind of books or study materials one refers to. One must always consult to their seniors or students who have cleared KCET in the past. This will give them an idea of books that they really should refer to. Clear Basic Concepts: KCET is not about cramming just anything in your mind for the sake of it. It is important for you to clear your basic concepts. Go deep into all intricacies to understand the topic well. Cover every bit of the syllabus. This will help you in getting a good rank in KCET. Practice Hard: Practice problem regularly for easy success in the examination. You should devote equal time on theory practical questions. Practicing problems every day will help you enhance your accuracy. Speed: Work hard to improve your speed. Solving 60 questions in 80 minutes is a big deal. In fact, it is not about knowing all the answers. It is actually about a student’s ability to answer a problem accurately in speed. Hence, you must try to attempt 70 questions in 80 minutes in your revision time. This will enable you to tackle 60 questions on the final day quite easily. Notes: It is important to jot down all points at one place as it saves a lot of time. These notes also prove beneficial during revision. These notes help you not avoid any important formulae. Previous Year Papers: Solving previous years’ papers is important as they give you an insight into the upcoming examination and its questions. It improves your efficiency and speed of attempting questions. In fact, most questions from previous year come back in the upcoming exam. Track Your Performance: Tracking your performance is important as it helps you identify your weak areas. Hence, you can work on these particularly areas accordingly to score good in the examination. Refresh Yourself with Proper Breaks: Spend some time with your family, friends, watch your favorite TV shows, read your favorite books to just break the monotony and improve your efficiency in KCET preparation. You can also practice some sort of meditation or yoga as they help in reducing the stress levels. Fresh mind can grasp more and at a higher speed than a stressed mind. Positive attitude: Keep your attitude always positive during the examination. Don’t lose your heart over small mistakes and keep calm. Try to identify the areas where you commit mistakes and rectify them. Positive attitude is a must to win the race. Read the question paper carefully: Stress during the examination is common but you should make sure to not miss on important instructions just because of this. Stay calm and read the paper and its instructions carefully. Mark the questions that seem to be simple. Attempt Simple Questions First: Don’t waste your time doing tough questions. Attempt all easy questions first then attempt tough questions. Avoid Making Silly Mistakes: The worst you can do to yourself in the examination is making silly mistakes in calculation. Avoid it as this costs you as many as 1000 points of rank. Manage Your Time Wisely: Don’t waste too much time on a question you are stuck on. Simply move to another question as it will help you save your time. Short-cuts and Tricks: You must not forget that KCET is an objective type paper. All you have to do is answer correctly by hook or crook. Use shortcuts and tricks to answer. However, this should not affect your accuracy.